Valance or Cornices adds an extra charm to the drapery system at home. The frill to the beautiful curtains is a welcome sight for all the guests and friends who visit the place. However, it is quiet difficult to find the cornices inexpensive or durable to corners or bends. Your search is over, inexpensive yet durable valance kits to adorn the drapery system back t home. Ingenious valance kits are easy to install, use, and maintain. 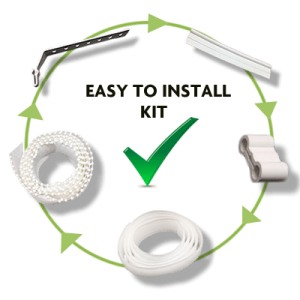 The standard valance kits consists of valance clips that are needed to hold the cornices irrespective of it being for wall mounted or ceiling mounted. The clips are designed innovatively to accommodate any kind of curtain system within the home. For optimum design and load support of the valance board, one number of valance clips is needed for every 9” of ordered/curtain project length. The valance boards in the kit are quiet flexible or bendable to accommodate any and all curtain design pattern(s). It readily snaps into the valance clips to form the framework for the cornices. The Velcro tape with beads is then inserted within the board. The beads are then flipped down to make them accessible to adhering with the Velcro tape later on. The Velcro tape is sewed-in behind the valance fabric and then adhered to the beads inserted in the board. Finally, to avoid falling off of the valance from the board, two end caps are used. The valance kit is highly compatible with both wall mounted and ceiling mounted curtain tracks system. The versatility of the kit along with its affordable pricing makes it the best for valance requirements. Apart from the, track mounting compatibility, it also goes well with all types of curtains. So, no need to think twice over damaging or unable to hold the curtain system. The kit is DIY friendly. The installation is quiet simple and easy in comparison to the complex box valances or any other systems for that matter. The flexibility required of the valance system is readily achievable with our valance kits. Be it curved or square bending of the track, the valance boards can easily comply with the requirement. Make your drapery system glow with the adornment of the valance system, that too inexpensively and with comparatively less efforts. Style the curtain systems in any way you fancy, turn the home into a holiday resort, into a farm house, a celebrity house or a beach house economically. Design your curtain systems and we will help you make it happen affordably.